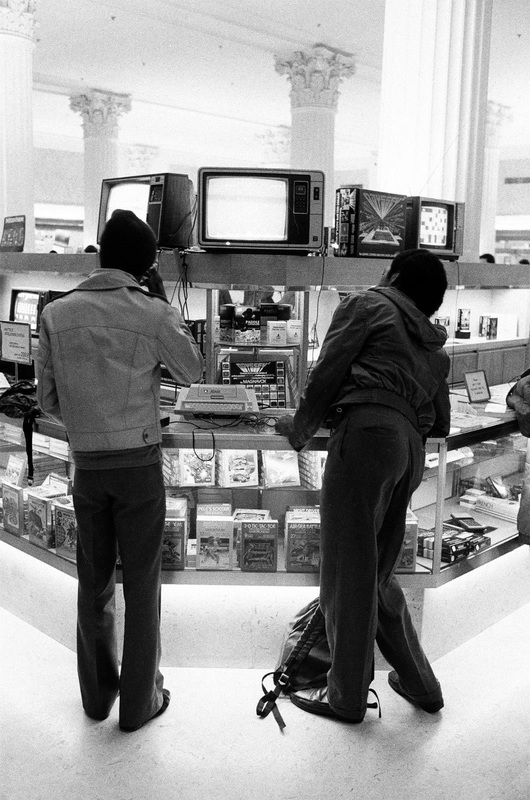 Date has to be at least 1981, if IGN is correct about the Asteroids release (see the game box in the glass case, just right of the guy on left). The shape of the barricades leads me to believe that it’s Space Invaders indeed on that far left screen…perhaps it’s a computer version that was released after ’81? Sometimes a year can make all the difference. Something about the architecture and fashion give me the impression that this is either somewhere in the Midwest or East Coast. I don’t recall seeing columns like that in any of the major retailers out here, especially not in the onset of the ’80s, when everything started looking futuristic. Then again, who knows? They don’t look like any of them, but I guess it could be the TV. Definitely not west coast. My first thought was Philly or NYC. My thoughts exactly—I actually thought Philly right off the bat, and I’m not even sure why. You can read the sign on the left, under Space Invaders: Mattel’s Intellivision System… $299.99. I remember getting ours at the local Service Merchandise for, I believe, $129.99. That would have been roughly 1982, and after months and months of begging on my part. I bet that’s exactly what it is. They just moved it over near the TV department. I spent so much time at counters like this. Are these kids ditching school? This ain’t what the game counter looked like on the weekends! Nice! Missile Command it is, and the 400/800 version was released in ’81. Thanks a million, Steve. Dood, crazy! Amazing what details you can conjure up! Woulda never known. wtg steve-o! You’re welcome. If anyone has Photoshop, it’s just Image > Adjustments > Shadow/Hightlight – it exaggerates the smallest variations in areas that seem like they’re pretty much one color/tone, so you can see the small variations in there.